Back in 2015 while volunteering at a local gallery, I saw a pastel displayed behind the reception desk. I thought why can’t my pastels look that good. I took down the name of the artist and did some research. I found out she taught classes and workshops. From mid-2015 through 2016 I was a part-time student whenever there was an open slot in the classes and became a full-time student in 2017. The classes helped me improve my skills. While classes will no longer meet weekly we will continue to gather every so often to critique finished work and help get suggestions on other pieces. Over the past year, I’ve taken classes regarding other mediums. I took an online class on watercolorlasy spring. Participants were given access to online videos then we met the instructor for a critique of our work. While the videos were helpful, I wanted some basic information on watercolor painting to learn things that I either didn’t know or may have forgotten. I found an online watercolor class by Liz Steel. She’s a well known urban sketcher (watercolor painting mixed with pen and ink). Here website is www.lizsteel.com. It’s only been a few weeks into the class but I’ve enjoyed it very much. She gives students a lot of information (downloadable lesson plans) with demonstrations videos to help you complete your homework for the week. Last fall, I participated in a Make It, Take It class on Acrylics. It is very much like the paint night events people go to with their friends. The only difference is the teacher is a local artist and the image you paint that evening is based on the artwork of that artist. I don’t work in Acrylics normally so it’s nice to learn something about a new medium and how to apply it to an artwork. Of course there are other mediums I could try. It’s always nice to try something new as well as develop new skills. As an artist, it is also a way to meet other artists and learn about their work. Happy New Year!! I hope everyone enjoyed the first day of 2018 and everyone looks forward to the coming year. 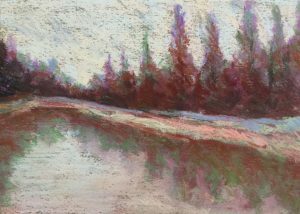 I’ll continue to work on my pastels honing the skills I learned during my classes in 2017. I plan to review class notes evaluating areas I did well and where I need to continue to improve. I know I should create more notans and small sketches to determine the best composition for a piece. In regards to exhibition opportunities, I am looking into a few possibilities in the next month or so (submitting artwork to be juried for acceptance to an exhibit). Another opportunity has presented itself but I’ll say more about it once I have finalized what needs to be done. 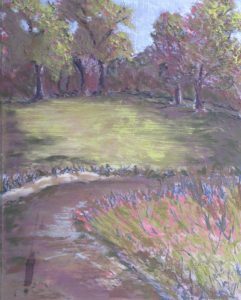 Finally, I have signed up for a pastel class in March. I took workshops with Shelly Eager in late 2015 and early 2016. When I saw a chance to sign up for a workshop, I did because classes and workshops at this Association go quickly. I also signed up for an online watercolor sketching class. I know when I did the 30 Day Challenge of creating a watercolor each day, my paintings became better over the course the challenge. I’ve seen this artist’s work online and thought it would be an interesting class. I’ll learn more about watercolor plus sketching on location with pen, ink and watercolor. Best wishes to everyone for a great 2018!! I need to remember when working on a pastel in winter I should cover it up before I transport it from the classroom to home. When I left for the class this morning, there wasn’t much precipitation that I thought about what I should have when bring the pastel home. When leaving class it was lightly raining. Of course, my pastel was taped to my drawing board and I had nothing to keep it dry. I tried turning it upside down exposing the back of the board to the elements. I thought that was a good idea. Turns out, during the steps from the classroom to the car, I must have brushed up against the pastel. There were slight streaks that would need to be fixed. I have in the past had water drop onto the pastel during, which makes for a glaring mistake. 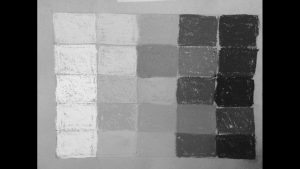 I need to remember bringing a sheet of glassine to tape over the pastel to protect from both the elements and from my winter jacket. Yesterday I attended an art critique. A local group has put together bi-monthly critiques open to the public. I’ve participated in group critiques during classes and workshops but I haven’t attended critiques open to artists working in various mediums. A critique allows you to gage whether or not your artwork connects with an audience. 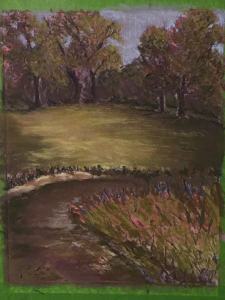 It was a small group working in Oils, Fabric Arts, and Pastels (me). As with any critique, you have to introduce the work. You give a quick background (why or how you came to be an artist) and discuss the work displayed. Some artists depicted realistic subject matters and others worked in abstractions. It was interesting to see the various styles. Overall, the feedback for me was positive. 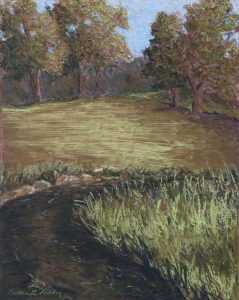 I showed two works from June 2017 from the Minuteman National Park near the Old North Bridge. One participant knew before I said it that the area was near the bridge (the bridge was not featured in either of the two pastels). The main questions about my work involved composition, mats, and frames. Ironically, the current pastel class I’m taken is all about composition. I’ll apply what I’m learning to future works. Perhaps the one thing I need to do to make my compositions stronger is to sketch out various compositions before working on the larger piece. I don’t normally make many small sketches of one scene. With the small sketches, I can determine if I need to focus on one area more than another or if I need to zoom in to find the best composition. I need to get into the habit of making smaller sketches to test things out. Mats and frames are always hard for any artist. Many times when you submit artwork into a juried competition, you use a standard white mat. When you are displaying your work in a non-juried exhibit you may choose any color. When working with a professional framer he or she may suggest certain mats (colors and surface texture). The framer may suggest a color that will not detract from the artwork, a color that is the primary color seen in the artwork, or a color that will enhance the over piece. 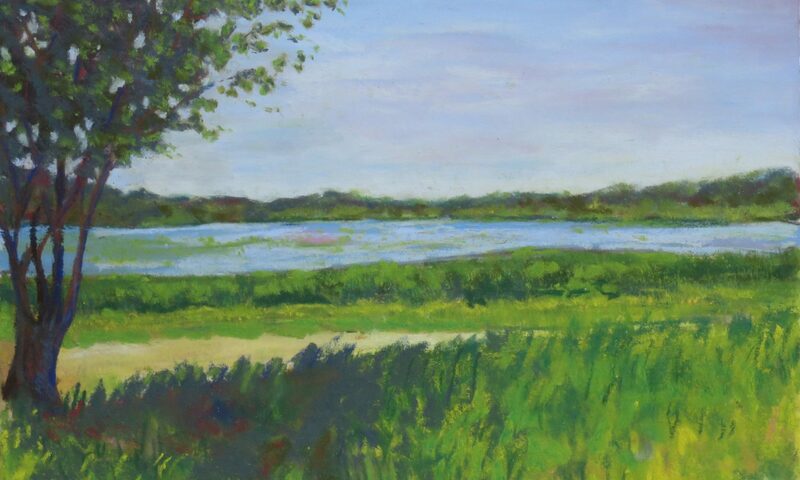 My framer suggested a color she thought worked well with my landscapes. A mid-tone violet was suggested as violets where used in the underpainitng and could be seen peeking through the greens of the landscape. Those attending the critique wanted to see seen a lighter mat. At the critique, they were not sure about the frames I chose. Frames are always hard. You try to be either consistent with the frames used or work within your budget while still trying to use frames that will work best for the artwork. Ironically, while this group wasn’t to sure about my frames a few people who had seen my exhibit in August commented how they liked the frames and thought they worked well with the pieces. It just shows everyone has their own opinion and it’s hard to get a 100% consensus. Since the weekly demos have started we have increased the number of views and number of 3-second views. Hopefully people are finding them helpful as well as reminding people what the store has to offer to our customers. Yesterday, I did a demo on Starting a Watercolor using Basic Techniques. Similar to other demos, I prepared an outline of what I hoped to discuss during the 10 minutes. By Tuesday afternoon and evening I began practicing the techniques. I wanted to show people how to apply paint to the surface, ways of correcting mistakes, and a few ways to add texture to your watercolor painting. It was a good thing to practice! I planned to show viewers how to use rubbing alcohol, salt, and a sponge in watercolors. In my attempts to use the alcohol, it didn’t work. Perhaps I wasn’t using enough rubbing alcohol. Checking YouTube, I saw someone dip a straw in rubbing alcohol and touch the paper surface. I tried that method too. It didn’t work. If it wasn’t going to work in a practice demo, I wasn’t about to try it in the actual demo. I changed it to using a splatter effect. It worked much better than the rubbing alcohol. At work, it was decided we would do presentations or quick demos on Facebook Live. It would be a great way to interact with our customers, we could inform everyone about the products we have to offer, and we could do quick demonstrations. I was asked to do the second Live segment—Introduce our customers to the various pastel products available at the store. I began thinking back to a college course I took on public speaking. I decided to do an outline and begin practicing. The outline came together easily in my opinion. I had an open (introducing myself and the topic), a middle (discussing paper, pastels, and various tools), and an ending (reminding everyone of our weekly Live presentations, where to see our calendar and where we are location for those new to our Facebook page. Now I’m practicing for the next Facebook Live segment —Creating a Pastel on Sanded UArt paper. 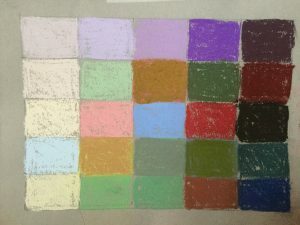 I thought I’d share the working process of my recent textured pastel. After creating the first textured pastel in class, I wanted to try it at home. I used a Gessobord instead of cutting a foam/gator board to a specific size then applying gesso to it. 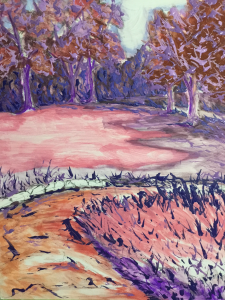 I created an underpainting of the scene then I dripped acrylic paint to the areas where I wanted more texture to appear. 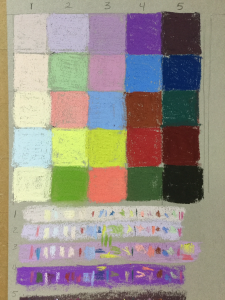 One classmate worked on her textured pastel at home as she wasn’t in class for the application process of the acrylic paint. She specifically used different colors for drippings depending on their location in the image. Many of us liked that idea and I thought I would try it on this one. 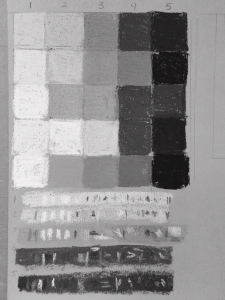 When the acrylic paint was dried, I applied the acrylic ground so the pastels could adhere to the toothy surface. The underpainting, acrylic drippings, and acrylic ground applied to the surface. I started on the background and slowly moved to the middle ground. After a while, I started working on all parts of the pastel but soon realized I had a problem. The colors started becoming muddy looking especially in the trees. At this point I thought I’d try what my teacher once suggested—if it’s not working, wash off the pastels and start again. The colors were looks muddy and I didn’t think I could get new colors adhere to the surface. I had done it once before and thought I’d try it again. I washed off the textured gessobord and let it dry. Washing off the pastels from my textured Gessobord. Looking at the artwork, I decided more texture was needed. Once I washed off as much of the pastels I could, I let it dry then dripped more acrylic paint in some areas. I started applying the pastels again after a few days break. This time it was working and I really liked how the trees were looking. Once the trees were set, I worked on the remaining sections. The middle was coming along nicely but I wasn’t happy with the stream and reeds in the foreground. My teacher had recently sent an email about her new blog entry. She discussed how she washed off a section of a pastel that wasn’t working the way she had hoped. It was worth clearing off that section as in my opinion it just didn’t look great. I washed off the stream and reeds and started again. I am happy how this textured pastel progressed. 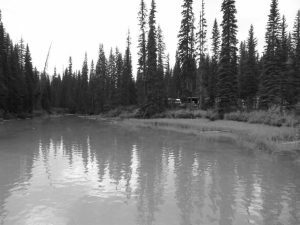 Creekside Stroll is on display as part of the Journey through Open Spaces exhibit.